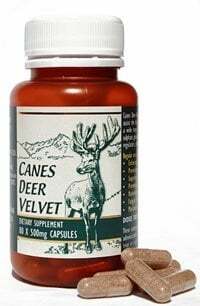 Canes Deer Velvet is available in 500mg capsules. Recommended dose is 250 to 3000mg taken daily. Start with just one capsule per day and build your dose up slowly over a week or two. For general well-being, supporting the immune system and circulation we suggest 250 – 1500mg daily. For sports performance and recovery, or for chronic joint pain such as in arthritis and rheumatism, we recommend the higher dose of 2000-3000mg daily. The benefits of Canes Deer Velvet become evident and increase over time. Some notice changes within the first week and for others it may take 2-3 months or more to feel the benefits. This is when you can expect the body to have built up its nutrient levels enough for repair and healing to be taking place. Likewise the optimum dose varies for everyone. Some get great results from 1 capsule daily, while others need more. Please contact us if you’d like to chat about an appropriate dose for your own specific situation, or with any other queries. As with most dietary supplements, before using Deer Velvet it is recommended that consumers consult their health professional. The use of Deer Velvet is NOT RECOMMENDED for people who are prone to allergic reaction to proteins, or people with cancer. Help yourself to be your best today! Check out this month’s special offers! Canes Deer Products Ltd, 441 Plateau Road, RD1, Reporoa 3081, New Zealand.